Another seed-sharing extravaganza is over, and my seed boxes are almost empty. All of the requested seeds are now divided and packed up, and many are on their way to their new homes. I’m still waiting for a few SASEs, so if you haven’t sent yours yet, it would be great if you could take care of that as soon as it’s convenient. At the end of this post, I have a list of all the orders that have already been filled. If you requested seeds and do not see your name on the list, feel free to leave me a message here or email me, and I’ll let you know when I receive your SASE. If your name is on the list but you haven’t gotten your seeds by December 6 or so, or if you requested seeds and have not heard back from me, PLEASE contact me right away. All in all, 123 of you ended up submitting over 1000 requests. Subtracting about two dozen specific requests that I couldn’t fill, I ended up sending out 988 individual packets of seed: a new record! Barely two dozen prepared packets were left. My apologies to those of you who didn’t get one or two of the things you asked for. I hope that the seeds that you did (or will) get make up for the disappointment. Thank goodness I’ve been so busy with this project that I didn’t get my fall garden cleanup finished, because I was able to collect additional supplies of many seeds from the still-standing seedheads, but in some cases, I just couldn’t magic up any additional seeds. I’d like to thank all of you who participated this year, with a special thanks to those who included cheery notes, surprise seeds, or extra stamps or postage money (that was a huge help!) with their return envelope. It makes me happy to know how much many of you look forward to this event. I want to keep offering unusual seeds, but I think I’m going to have to find another way to do it next year, to make the process easier for all of us. That will likely include listing all of the available seeds in my Etsy shop as they become available through the growing season. As I add new seeds, I’ll put a note in the Blog News box in the sidebar, in case you’re interested. Nan you are so amazing for doing this again…it’s such an amazing resource…and I’m so glad it continues to be successful…you are the best! It’s my pleasure, Scott, really. Hope you and yours have a great holiday! Thank you so much for the hard work that this seed giveaway entails. I didn’t know you had an etsy shop, I’m off to check it out. Have a happy Thanksgiving, Nan. I wish you the same, Alison. Your seeds should be there soon! This is the first year I’ve participated in your exciting seed project, but it won’t be the last. You are so generous with seeds and time, and your good nature and cheerfulness make it all fun, as well as adding so much to the general store of botanical information in the world. You are sort of an existential Pied Piper of Plants! With gratitude for a great year. Just think how many thousands (or gosh, even millions) of seeds a garden can produce. So figure it this way: each seed you guys have asked for is one less potential “weed” for me to pull out next year! Nan, the donation of your time is as greatly valued as the seeds themselves. I hope you have a wonderful – and relaxing – Thanksgiving holiday! The same to you, Kris. I’m looking forward to spending the holiday with a clutter-free desk in a chaff-free office! You are an amazing women and gardener! I estimated that you will send out about 800 packets and you beat that by 200! Happy Thanksgiving to you and your family! I too figured about 800, so it’s a good thing I bought an extra box of envelopes. I can’t say that I’m thrilled with the resealable plastic packets I chose this year, because they’re hard to label and the seeds stick to the insides unless they’re packed separately. But, they do a good job keeping the seeds inside, they’re lightweight, and they’re lots cheaper than the traditional paper envelopes. I think I’ll experiment with other options next year. Anyway, Happy Thanksgiving to you and yours too, Daniela! I requested seeds. But how do we know if we “won” any of if out name was chosen? How interesting: I didn’t know that it came true from seed. I’ve grown it in a pot but have never been brave enough to try it in the ground. Best of luck with your Hayefield seeds! I’m growing variegated petasites, in a damp/wet area under my spruce tree where it’s completely happy. It was a start from a friend, not from seed. It’s not as vigorous as the regular petasites; I find it easy to manage but I’m in zone 5a (formerly 4b). It might be more aggressive in a warmer zone. Oh yes, it can go pretty crazy here in Zone 6. It’s one of those plants I like to see in other people’s gardens but would be afraid to let loose here at home. ‘The pied piper of seeds’ -I like that! I don’t think I would have guessed the top five seeds, interesting, I’m glad you put that together. Thanks for letting me know, Frank. Now I regret not collecting seeds from the variegated plantain too. I’ll have to see if it pops up again next year. The package came yesterday. How busy you have been. Last night I looked at all the lovely cards and tonight I looked at the seeds. The glass corn kernels are so beautiful. I marvel at how your fingers made the tiny folded packets inside the resealable plastic packets. The verbascum seeds are so tiny and the plant will be so tall! amazing. It’s super to hear that you liked the notecards, Chris. Making the little waxed-paper packets ended up being necessary; if I put the little seeds in loose, they’d just cling to the inside of the plastic. It truly is astounding to think of those tiny seeds producing such a sizable plant. The same goes for Veronicastrum virginicum: it’s a miracle that the plants can self-sow, with their practically dust-like seeds. Even though I didn’t request any seeds this year. I saved my own seeds from what you sent last year… so Thank You Again! This fun project… looks like such work- I wish I lived on the other side of the continent so I could help you! That’s super news, Kay; thank *you*! Hi Nan, thank you very much for the seeds, card and photo of your 2 boys (Duncan and Daniel). Really appreciate all your hard work, you are such a kind generous lady. Hope you have a wonderful thanksgiving. God bless you. Nan, this is such a wonderful service you provide, both educational and generous! You can read about interesting plants in lots of places, but there are few that actually give you the ability to grow them yourself at virtually no cost. It’s like having a friendly seed-sharing neighbor no matter where you live. Thank you! I’m also curious: what were the least-requested seeds? I wonder which plants most people didn’t want. I’m so glad you asked, Alan, because I too found that interesting but felt sorry for the overlooked plants and didn’t want to publicly announce their unpopularity; now I’ll do it anyway. Those with no requests at all included Andropogon virginicus (broomsedge), Elymus hystrix (bottlebrush grass), and Eucomis comosa [collected from ‘Oakhurst’] (pineapple lily)–something dozens of people wanted last year, when I had very few seeds. And those with only one request: Abelmoschus moschatus ‘Mischief’ (musk mallow), Andropogon gerardii (big bluestem), Helenium puberulum (rosilla), Hibiscus laevis (halberd-leaved hibiscus), Liriodendron tulipifera (tulip tree), Platanthera lacera (ragged fringed orchid), stem lettuce (celtuce), Tripsacum dactyloides (eastern gama grass), and Zea mays [collected from ‘Tall Tiger’] (corn). By the way, your seeds are on their way! Hi Nan, thank you so much. Collecting, sieving, cleaning, packaging, and labeling nearly 1000 packets–the effort borders on the heroic. I’m excited to try the Amsonia, Digitalis, Verbascum, and Vernonia in the continuing quest to find species that the deer will not eat (at least not more than once). I imagine the Petunia will be a treat for the hummingbirds. Was that your experience? 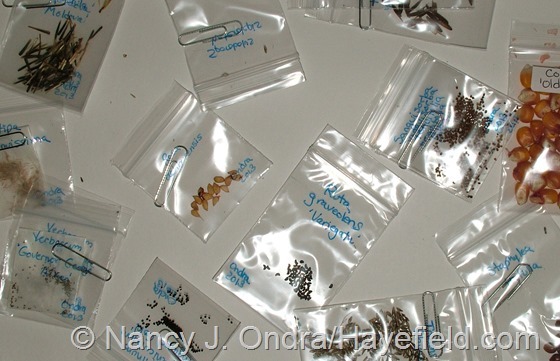 By the way, if you wish to try using glassine envelopes in the future, they are available in bulk from the North American Rock Garden Society (https://www.nargs.org/seed-exchange/glassine-envelopes), not to mention seed of a few thousand more species. I make no promises about those plants being safe from your deer, Michael, but I wish you luck with them. Yes, I did see some hummingbirds around the petunias. Thanks ever so much for the lead on the glassine envelopes; I’ve already placed an order! Hi Nan – I’ve been dreaming weedless, bugless fantasies of where each of your seedling progeny will land in the borders. Many thanks. Still chuckling over the fact that Datisca cannabina is not exactly at the top of the request lists. Hope it germinates! Poor Datisca: only you and two others appreciated it. Those seeds are tiny, too, but I find a half-dozen or so seedlings each year, so they should be viable. I wish you good luck with it, and the other seeds as well, Tiuu. Nan, you are amazing. Your generosity is truly inspiring. Thank you, Barbara, and good news: I sent all four of your requests off this morning, so they should be with you by next week. I feel bad for the eucomis now! I have one coming along from your 2011 seed and it’s a favorite. Today I was looking at two more packets from last year’s NARGS exchange… you may have started me onto something! Neat – you actually got some started! Don’t worry about the fate of the unspoken-for seeds: a friend has already given them a good home. And next year, I’ll leave the flower spikes alone instead of continually picking at them to get as many seeds as possible; ended up breaking several of the stalks doing that. Glad to hear everything arrived safely. It’ll be interesting to see if the Veronicastrum ‘erica’ seed produces pink offspring! I’m also trying V. sibiricum ssp japonicum from the Gardens North seedhouse this year, its naturally pink-purple so I’ll be in luck either way. I’ll be interested to hear how the ‘Erica’ turns out for you, Jesse. And congratulations on your success with the lilies! I am so sorry for my delay in mailing my envelope! I had pneumonia for 10 days and am just catching up with my life. I mailed today, so you should have it soon. Thank you again for sharing your seeds. I will definitely pay it forward. Not a problem, Ellen; just wanted to give folks a gentle reminder. I’m so glad you’re feeling better now! Nan, I just received the seeds. Thank you again. I am like a miser with the coins of summer, chortling at my hoard through the dark cold days.. And come spring, a profligate planter, and next fall, I hope, a generous passer-along. Blessings to you for the holidays, and a happy, lush, new year. Thanks for letting me know, Lisa. I know what you mean about treasuring your hoard of seeds through the winter; I too have already been pawing through my box of seeds for next spring, envisioning new combinations. I appreciate the report, Christin. Enjoy! Oh, the marigolds weren’t neglected: each of the three got at least a dozen requests, and ‘Moldova’ had 18–almost enough to get into the top-requested list. And now that the weather is getting a little milder, I can get back to my garden cleanup. It’ll get something accomplished until sowing time, at least. Have fun with your seeds! Nan, the seeds arrived yesterday — such excitement! That’s so reassuring to know you have an Etsy shop to check in on seed availability. Thanks again for getting fall and winter off to a rousing start. Another successful delivery – whew. I hope to put more seeds in the shop in the next week or two. Have a great holiday, Denise! Do you have any advice on germinating lavender seeds? I’m not picky about cultivars. Whatever I can get to grow is going to be the one for me! Hi Casa. I’ve only tried Lavandula angustifolia and Lavandula viridis from seed: the former purchased and the latter home-collected. I sowed them in late February or early March on a heat mat under shop lights. The first time, the L. angustifolia didn’t sprout at all; the second time, the first seedling appeared on day 13, with some scattered germination over the next 3 weeks. The L. viridis started germinating on day 16 and pretty much all sprouted over the next 10 days. In Seed Germination Theory and Practice, Dr. Norman Deno reported relatively poor germination percentages (5-20%) for “L. spica” (L. angustifolia) in warm, cool, and outdoor sowing. Others have reported better results by chilling the sown seeds in the refrigerator for several weeks before moving them to warm conditions. I think the conclusion here is to give warm sowing a try, try chilling the pot for 2 or 3 weeks if no seedlings appear after a month, and then buy a few plants instead if all else fails. Er…I hope that helps. Hi Nan! Thank you for the seeds! By the way: The paper of your cards is perfectly appropriate, and matches the images – gorgeous!The colours are rich and true without being all glossy and plasticy looking – so all fits well with your garden, it seems! Thanks, Clark! And thank you in return for the seeds you shared with me. Glad you liked the cards! Nan, I will send mine out this afternoon. I am sorry I got caught up in the holiday madness! I hope you had a wonderful Thanksgiving. Thanks again!!!! No problem, Jen – your seeds are safe and ready to go whenever the envelope arrives. Nan, thank you so much for my wonderful seeds I asked for! This is my first seed request and I am sure that it won’t be my last……that is if it continues next year. I will remember to save seeds for you too. Thank you for all the time and effort you have put in this adventure! I am looking forward to Spring!!! Peace, and joy. Thanks for the update, Karen. I know…I too can’t wait for spring and it’s not even officially winter yet! all is well over here: The seeds have arrived! Thank you so much. I’m looking forward to next season already. Thanks for letting me know, Britta! I was out of town visiting my parents in KY for the week of Thanksgiving, and when I came home, the envelope of seeds from you was waiting for me. Such excitement! Thanks again for your generosity! Have a wonderful holiday season. It was my pleasure, Deborah, and I’m so glad you were pleased too! I received my seeds, I’m not sure exactly when to start them since I like to get them fairly big under lights before planting out. I already started some seeds so I am experimenting. Thanks so much for sending so many nice seeds! So good to hear that they’ve arrived. Have fun! Nan, Your seeds have arrived and my daughter and I are thrilled! She is eleven and my gardener-in-training. We especially enjoyed the pictures of Daniel and Duncan. The picture is on our refrigerator. I am excited to have a piece of Hayefield growing here in in Missouri. Many thanks for your kindness and generosity. Happy growing! I wish both of you great success in sprouting and growing the seeds, Faith! Nan, Thanks so much for including me in this. I received your seeds today. Spreading your garden to all of us, is the best kind of joy to spread this holiday season. I couldn’t ask for a better gift, than the hope and excitement new plants in my garden brings! Many wishes to you and your garden this year! I am *so* glad we connected on Etsy, Jen. I wish you loads of luck with all the seeds next spring!